Your tour begins in the capital city of Athens. This evening, join your fellow travelers for a welcome dinner in Athens’ historic Plaka district. In a traditional taverna, feast on local cuisine and wine while enjoying Greek entertainment. Enjoy a panoramic tour of the highlights in Athens showcasing the city's ancient and glorious monuments, such as the Temple of Zeus, the Royal Palace, the Tomb of the Unknown Soldier, and the Olympic Stadium. Next, it’s your choice! Choose a comprehensive tour of the incredible Acropolis -OR- embark on a walking tour of some of the city’s hidden gems, including Pnyx – where democracy was formed in Greece – and the Temple of Hephaestus. This evening, perhaps you’ll choose to join an optional local food tour of Athens. Travel north through central Greece to Thermopylae. Stop to see a monument dedicated to Leonidas who died defending the city against the Persians. Arrive in Metéora and visit two remote monasteries situated in a unique landscape of limestone rock “towers” that extend nearly 900 feet into the air. 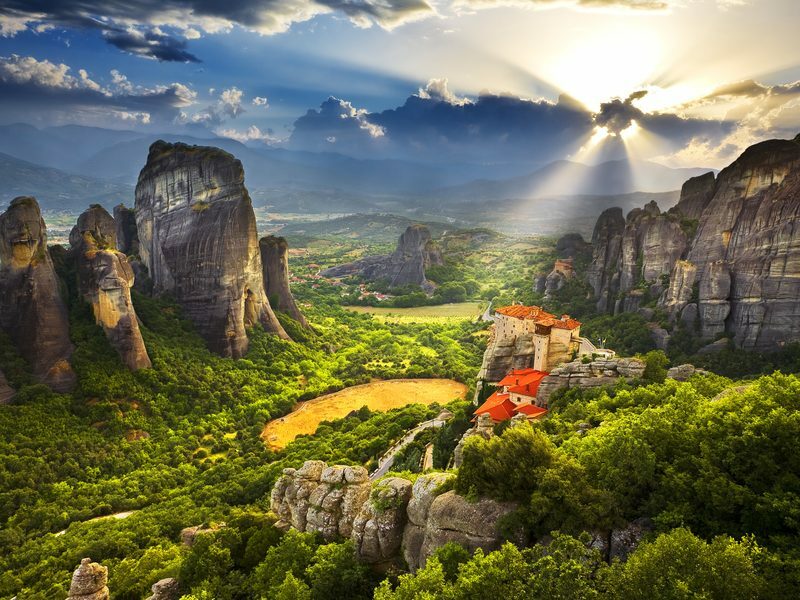 Over 600 years ago, Byzantine monks chose to build their monastic community perched atop these virtually inaccessible rocks. End your day at a family-owned taverna where you will savor a delicious meal with recipes passed down from generations. This morning, visit a local studio to see painters at work creating beautiful Byzantine icons. Continue to the ancient city of Delphi, one of Greece’s most important religious centers during Classical times. 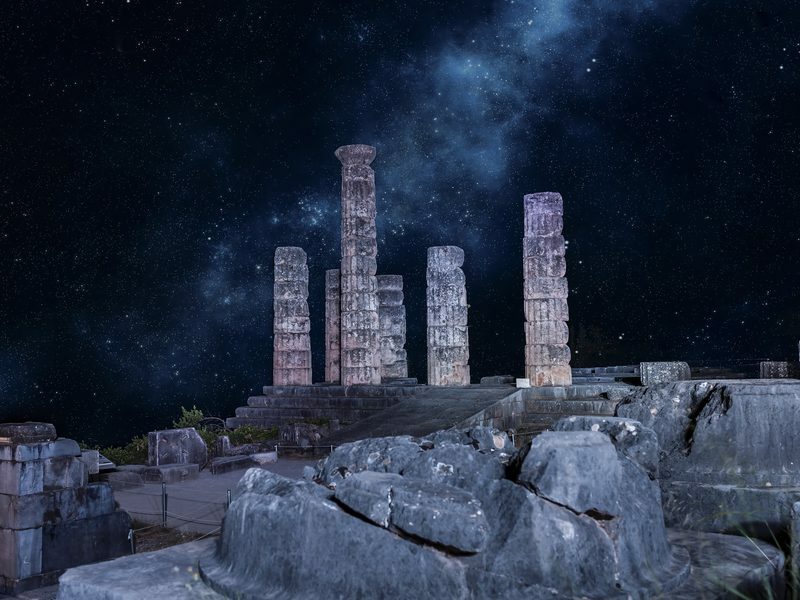 A local expert guides you on a visit to the Sanctuary of Apollo, the Doric Temple, the ancient theatre, and the Delphi Museum with its priceless collection of ancient artifacts. It was here that the famous Oracle was consulted to foretell the destiny of Man. Continue on to charming Arachova, a popular ski resort town with breathtaking views of the surrounding mountains and valleys. Travel along the Gulf of Corinth, crossing into the Peloponnese to the historic city of Olympia, a testament to the grandeur of ancient Greek civilization. Visit a local farm in the countryside and meet with the owners to learn about everyday life. Following the tour, enjoy a tasting of local wines, olive oil, homemade jams, marmalades and sweets. 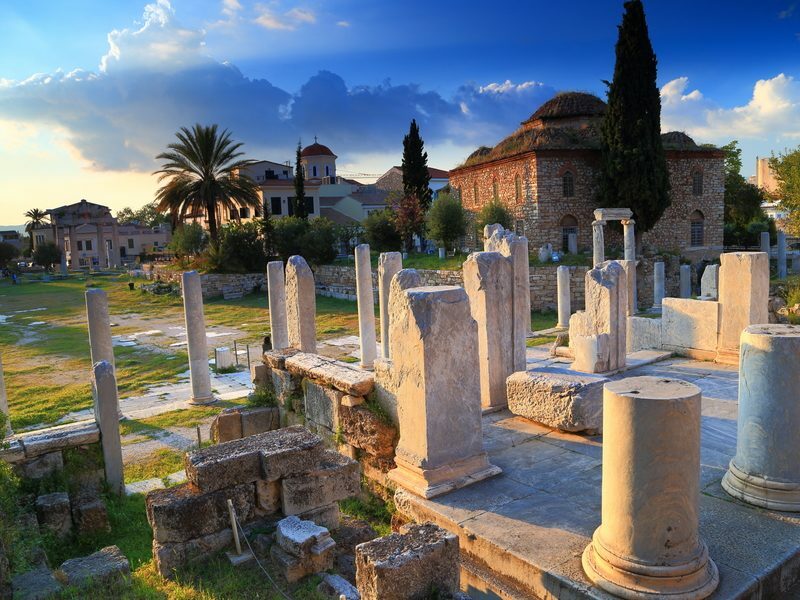 Your guided visit to ancient Olympia includes a tour of the sanctuary of Zeus, the Olympic Stadium – where the first Olympic Games were held in 776 B.C. – and the museum. Next, learn how to cook some of the region’s best dishes as you partake in a Mediterranean cooking experience followed by a traditional Greek lunch. This evening, broaden your knowledge of traditional Greek musical instruments and folkloric dances with a delightful Greek dance class. Enjoy spectacular scenery as you cross the Arkadian Mountains en route to the ancient city of Mycenae for a guided visit of the excavations featuring the Beehive Tombs and the Lion Gate. Your day ends in the picturesque seaside resort of Nafplio. This morning, transfer* to the port of Athens for the high-speed ferry ride to Mykonos, the whitewashed jewel of the Cyclades Islands. 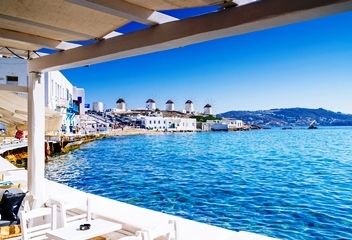 Enjoy magnificent views as you cruise across the brilliant Aegean Sea to this island paradise. Enjoy a relaxing day to independently explore the charms of Mykonos. 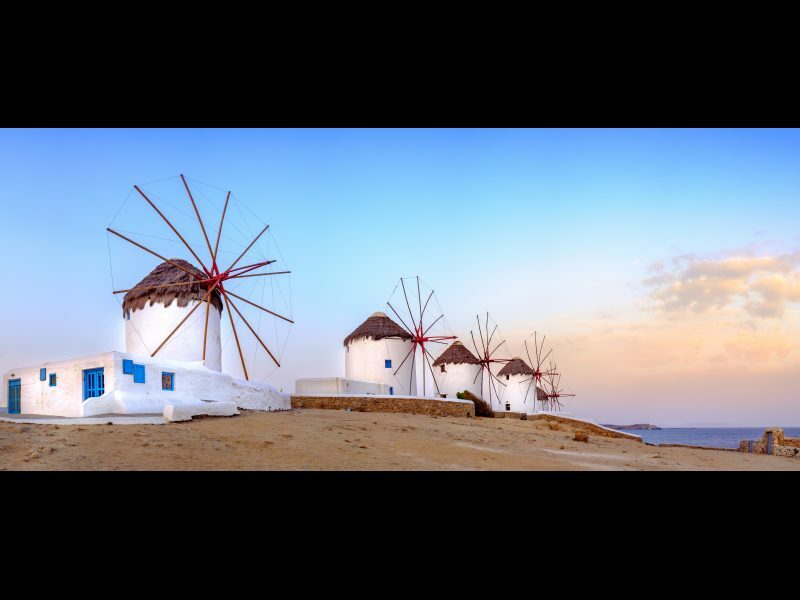 Don’t miss Mykonos Town, where mazes of narrow streets link the whitewashed buildings and traditional life continues amidst the bustling activity. Cruise to the most spectacular destination in the Mediterranean, the fabled island of Santorini. Begin your day with a visit to the excavation site of ancient Akrotiri, the most important prehistoric settlement found anywhere in the Eastern Mediterranean. Known as the "Minoan Pompeii," the flourishing town was at once destroyed and preserved by a volcanic eruption around 1450 B.C. 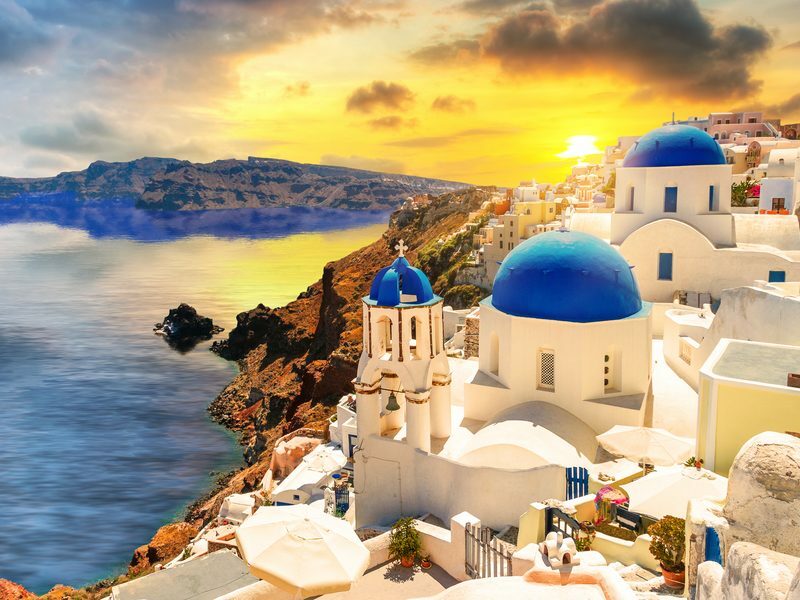 Next, travel through a fascinating landscape of vineyards, whitewashed chapels and volcanic cliffs to the spectacular town of Oia, where the best views of the crater are found. End your day with a visit to a local winery that produces the unique and famous wines of Santorini. Your day is at leisure to relax or independently explore Santorini, considered one of the most stunning landscapes in the world. Shop in Thira’s charming town center, take in the breathtaking scenery, visit a local museum or simply enjoy the amenities of your hotel. Bid farewell to the Greek Islands and fly back to Athens for your overnight stay. Celebrate the end of a memorable trip to Greece with a delightful farewell dinner.